The new Makita RT0700C Compact Router features a variable speed motor that delivered 10,000 – 30,000 RPM's at 1-1/4 HP max. Additionally, the motor features an electric speed control that maintains constant speed even under load and a soft-start feature that makes the router easier to handle. The RT0700C comes with a standard router base that uses a rack-and-pinion system to offer fine depth adjustments. A cam-lock system allows users to makes faster adjustments as well as quickly remove the router base. The RT0700C includes a 1/4" collet, 3/8" collet, straight guide, template guide, dust nozzle – straight base, and two wrenches. Those looking for more features should check out the RT0700CX3 kit. It comes with everything that is included with the RT0700C, but also includes a plunge base, tilt base, offset base assembly, dust nozzle, side handle, trimmer guide assembly, and tool bag. The one feature that really sets this above other routers in the same class is the offset base; if you are looking the use the RT0700CX3 as a laminate trimmer replacement, the offset base is a must have, as it allows the router to trim as close to 3/4" away from a wall. 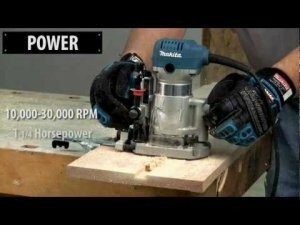 This new router from Makita offers a 6.5 amp, 1-1/4 horsepower. Its slim and ergonomically designed body allows for increased comfort and control. The RT0700CX3 offers a variable speed control dial (10,000 - 30,000 RPM) that enables the user to match the speed to the application. You also get a smooth rack-and-pinion fine depth adjustment system for more precise settings. A quick release cam lock system for convenient depth adjustments and base removal/installation and electronic speed control maintains constant speed under load. A soft start feature allows for smooth start ups while the high visibility base design improves handling and performance. The base can be removed quickly to install other bases and the heavy duty aluminum motor housing is engineered for increased durability.